A small tray of 3-year-old seedlings, getting nice autumn colour. Canadense album is always bright yellow here. 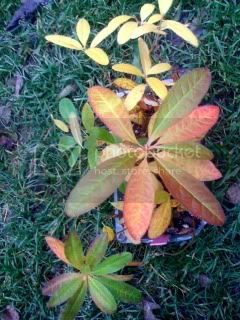 The hybrid seedlings are easy to tell apart by much bigger leaf size and reddish fall colour. The yellow and small leaved ones in the upper part probably resulted from self pollination or are otherwise dominated by canadense characteristics. Some of these seedlings have first flower buds now (Dec. 2013).